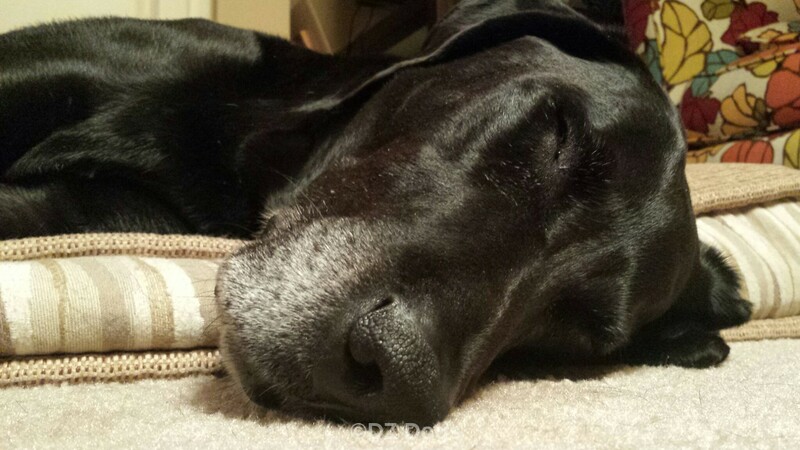 Back when we first adopted Dante he suffered from a multitude of allergies, he was constantly breaking out in itchy bumps, flaky dry skin, and/or suffering from runny poo. We tried several different foods and slowly ruled out different ingredients, turns out he's allergic to Chicken! 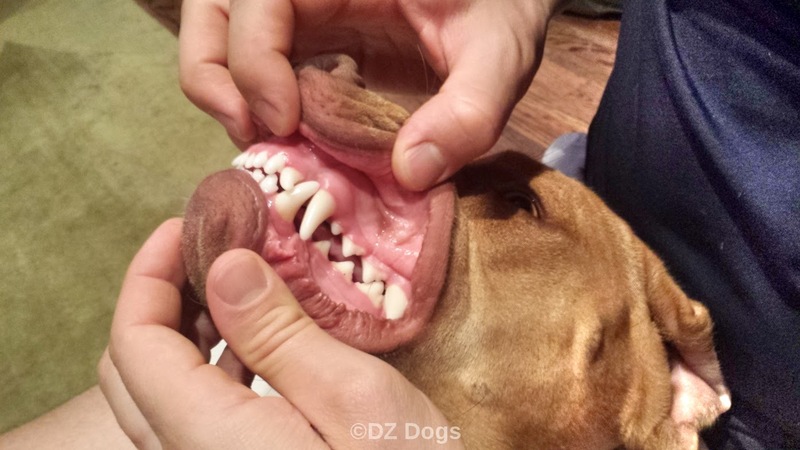 A problem that often hits large breeds for some reason. But his skin still wasn't up to par so we began trying out different supplements and oils. Although fish oil is great for your pup it can fortunately give some dogs bad gas. This was the case for Dante and so the oil had to go! Coconut Oil - I wrote about this wonderful oil HERE at the time though we didn't know it was such a good supplement. Now our dogs eat it on a semi-regular basis. Kelp - Many people are aware that kelp is great for humans, but it is also slowly being recognized by veterinarians and those who support a holistic approach to pet health. Seaweed/kelp is full of natural salts and minerals. Kelp is known for being iodine rich which can help to keep your pup's glandular system nice and healthy, especially the thyroid, adrenal, and pituitary glands. Some people also believe that kelp is a natural flea repellent if it's a part of your pet's regular diet. It also helps improve the condition of your dog's skin and coat. Being high in iron kelp is heart healthy, it helps your dog to naturally strengthen their immune system - something to think about if you have a senior in your house, and due to the amino acids kelp is thought to help your dog heal from surgery quicker. The Japanese claim kelp is a source of longevity! Great for pregnant and lactating females due to the many vitamins - can help them to birth healthier pups with higher survival rates. Kelp is recognized as containing: Anti-cystic, anti rheumatic, and anti-inflammatory properties. We put Dante onto a supplement powder called "Kelp Help" you sprinkle it over the top of your dog's food. And Dante seemed to like it! This is not a paid promotional post, we purchased this from our local pet store and we've loved how it has helped Dante with his skin issues. It really helped with his skin issues, and I loved all the vitamins - it's practically a daily multi vitamin for your pet! And since health is important to us and we participate in many outdoor activities we want to be active in preventing injuries in our dogs. So the hubby and I love sushi....LOVE SUSHI. We've started making sushi at home because we can eat as much as we want without spending one to two hundred dollars on a meal (ouch..but it was our anniversary so we had fun!). And the hubby loves just munching on the nori sheets so he thought it'd be fun to give the dogs a bite, which ended up being really funny! 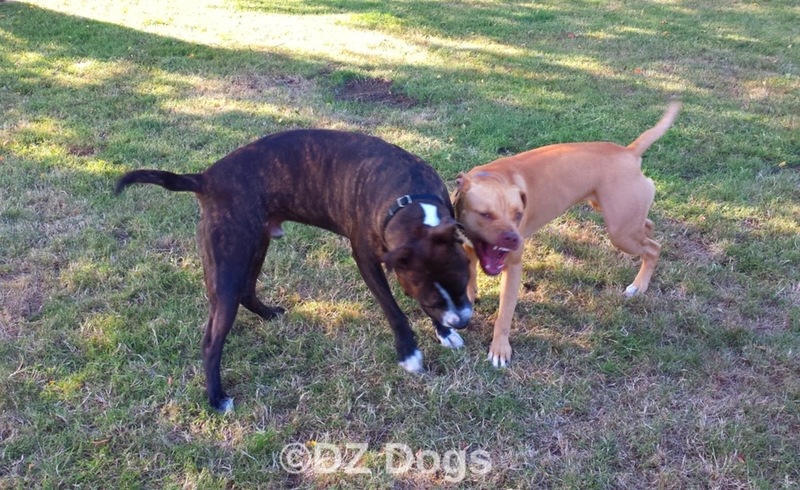 We ended up letting the dogs take turns biting off a mouthful of the whole sheet! Be careful to not over supplement your dog, high doses of too many vitamins and minerals can cause your dog to become very sick. Check the label to make sure you are getting high quality ingredients and to adjust your dog's diet if needed. The labels always give a serving size suggestion, these suggestions are intended for healthy dogs, if your dog has any health issues, chronic disease, or is being treated by your vet please call your vet before adding supplements to their diet as your dog may have different needs and nutritional requirements. 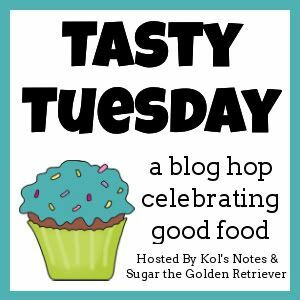 Tasty Tuesday is hosted by Kol's Notes & Sugar the Golden Retriever. While the hubby and I were in Florida visiting family we made contact with Walks with Rama and decided to try and meet up! It was a bit of a mess at first. Poor Shannon was balancing kids schedules, hubby schedule, dogs, and Sassy's Eukanoba competition! Thankfully we were able to make it work and decided to try and meet somewhere in the middle so that no one would have to spend all day driving. I just gotta say... I have always wanted to meet a Cane Corso. Before we adopted Dante we looked at Mastiff breeds including Dogo's and Corso's but as we were looking at the different dogs available at the rescues we just weren't finding the perfect dog for us. Expanding our search to bully breeds in general, we found Dante! His story HERE. 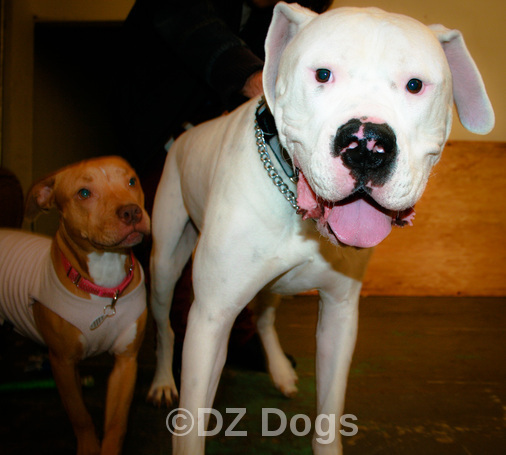 Later when we were looking again - we actually met a giant Dogo Argentino named Lio, he was Ziva's best buddy at the rescue. But we decided he was the wrong personality to match with Dante, and that's how we found little miss Ziva. Her story HERE. That's Ziva next to him!! Cane Corso - pronounced "kah-nay korso". I'm guilty of just learning this...I've been pronouncing it wrong all this time! Cane Corso's are also called Italian Mastiff's and are one of two native breeds to Italy that descended from the Roman Canis Pugnaces. According to the AKC the breed's name derives from the Latin meaning "Cohors" which means "Guardian" and "Protector". 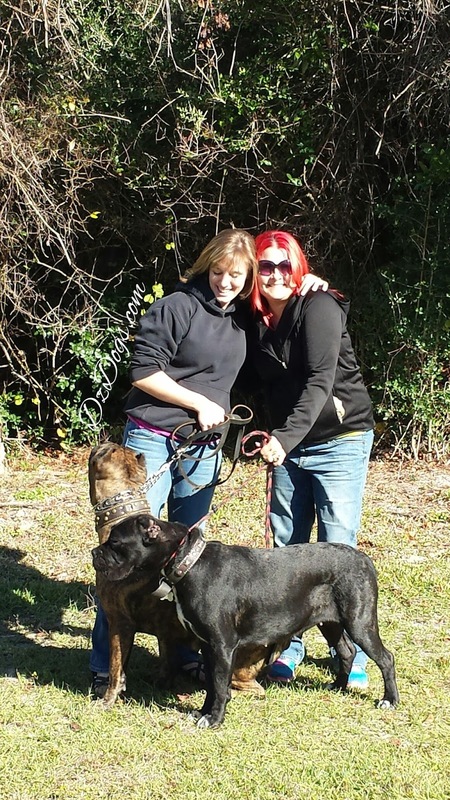 When I met up with Shannon she said that Cane Corso means "Dog (Cane) of the Courtyard (Corso)." They are a true Guardian Breed. Like most mastiff's they are great family dogs, loyal and loving, good with children. But THESE DOGS ARE NOT FOR EVERYONE. Like a true bully they are stubborn and not for the novice dog owner. These dogs require strong leadership and training. They are powerful guardian breeds - who require proper handling and ssocialization They can also be downright destructive at times - just see Walks with Rama's blog, Hurricane Cairo was appropriately nicknamed! 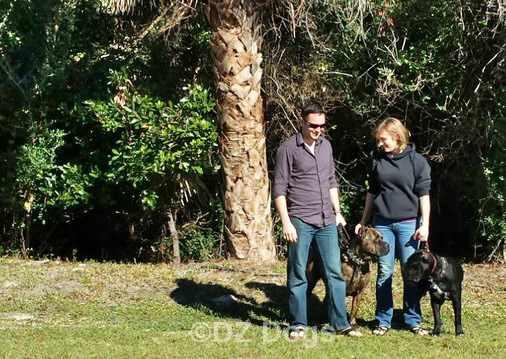 Hubby and I were thrilled to be able to meet Shannon and her gals Rama, and Cairo! We decided to meet at a coffee shop in Daytona, Florida. I knew she'd be easy to spot, she'd be sitting outside with the two giant dogs! And we were not disappointed, with her glorious mane of bright red hair and dogs that resemble bears from a distance we found them easy. Sure enough the size of these dogs was impressive, but so was their demeanor. Cairo who is younger than Ziva was totally chill! She was happy to just lay at our feet while we visited. Rama on the other hand is a total Queen Baby. Brought out of her warm car, she shivered, and shivered in the shade the whole time we were outside. 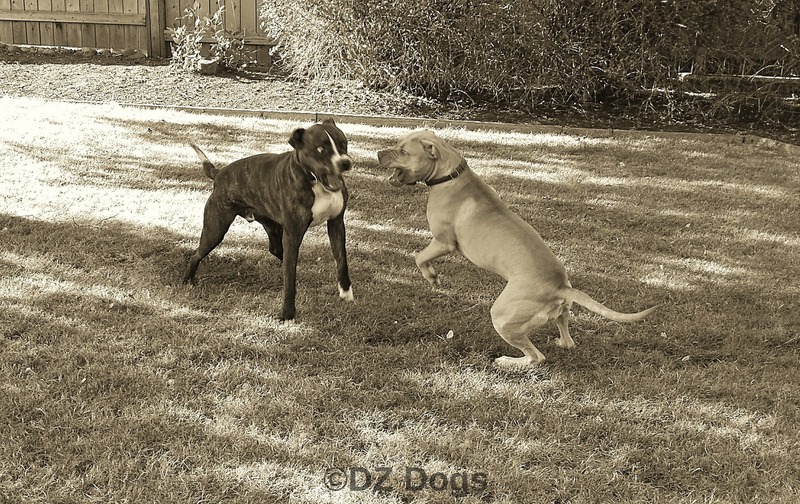 These dogs were so much fun to hang out with! We even got to see them in action around a 2 year old toddler who couldn't get her hands on Cairo quick enough. Her poor mom's eye's nearly popped out when her daughter ran up to hug the giant black mass of muscle that is Cairo. But Cairo's big teddy bear eyes and squishable face quickly softened up mommy as she watched her toddler touching and gently being kissed by these giant dogs. Rama was happy to just sleep the whole time the little girl was petting her. It was wonderful to have coffee and hang out, the dogs were very relaxing to be around thanks to their docile and calm nature. 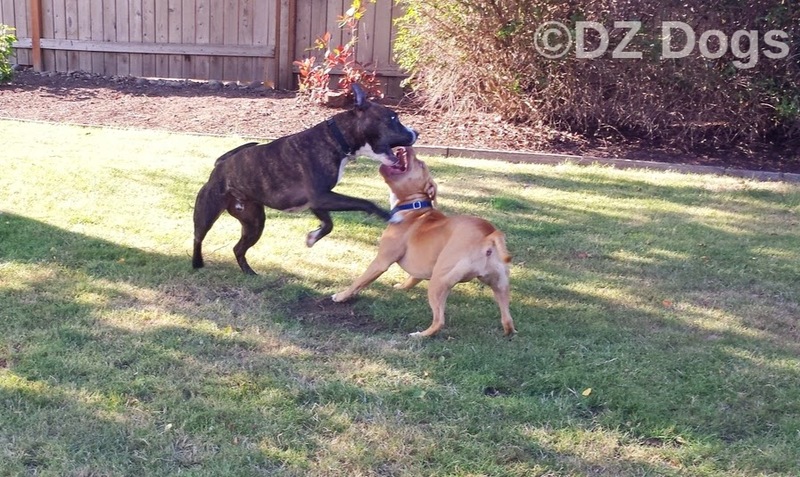 Dante is either ON or OFF he doesn't really ever slow down, Ziva is a bit mellower than Dante but nothing like these two lovable lugs! And you definitely feel safe surrounded by giant dogs. While visiting with Shannon I learned that Cairo is the smaller Corso of the bunch, apparently she was brought over from the Czech Republic with the intention of being a show dog but unfortunately had a joint issue, and now she is just a beloved family pet. Although her destructive behavior has her hubby sometimes near tears. But how could you not love this dog! As for Rama, she just turned 4. 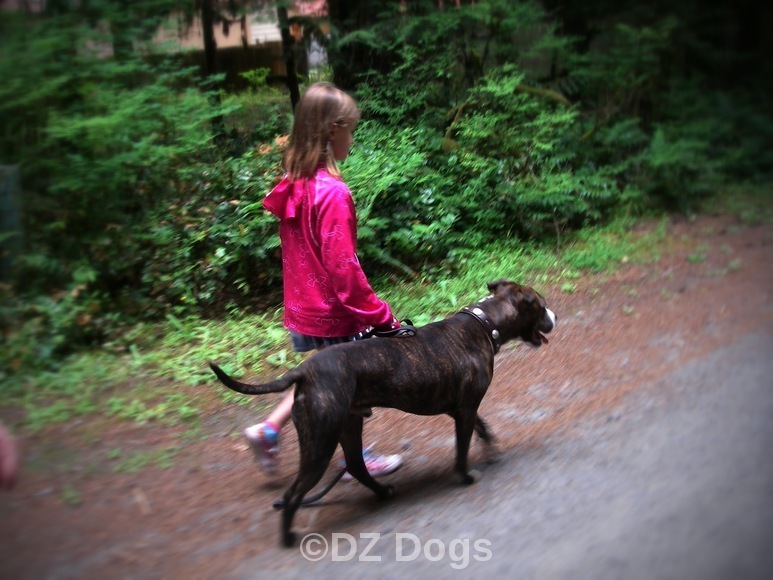 The blog is for her as she was Shannon's first Corso. Rama is a registered Therapy Dog, she likes to visit old folks homes, schools, hospitals, and hike/play with her family. She is also a gorgeous show dog. Look at Rama's huge head! Sorry I didn't get any up close pics with Rama, she didn't want to be out of the car because it was too cold for her precious royal self. It was all we could do to keep her with us, when a giant lady like Rama wants to go back to the car their isn't much you can do to stop her. I was laughing at my husband when Rama was dragging him down the road, I thought he was joking but it turns out he really was being dragged! And when she doesn't want to go somewhere she lays down and becomes a giant dead weight! We wanted to take some quick pics but Rama wasn't as cooperative about being outside as Cairo was. We had to trick Rama out of the car, once she came out she changed her mind and went back in with Cairo following. We then bribed her out again and quickly closed the door so she couldn't hop back inside. The dogs wanted to go back to the warm car. We decided that we are pretty sold on this breed, and a Corso might be definitely be in our future. Not immediately though! We have our hands full as it is, but maybe as a fun dog to go into retirement with. 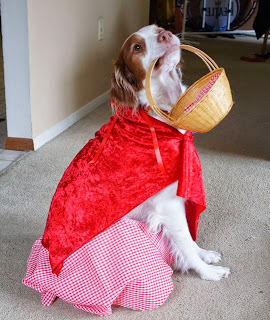 Mischief Monday hosted by Snoopy's Dogblog, Alfies Blog, and My Brown Newfies. Have you heard of CorgiPants? If not then you should go take a look! This year is my first year participating in the 3rd Annual Pet Blogger's Gift Exchange of 2014 hosted by Something Wagging This Way Comes. Thanks to this exchange I was matched with a gal named Jenna who has two lovely dogs; Taco and Dot. Looking back through her archive she's been blogging since 2007! Boy does that make me feel behind. First off meet Jenna - apparently she loves turkeys and collects them year round and shows them off for thanksgiving. Happy Turkey Day! What a cool thing to collect! On top of that she loves quilting, and seems very creative with her hands preferring to make her own fun projects like dog beds, leashes, and toys (to name just a few). 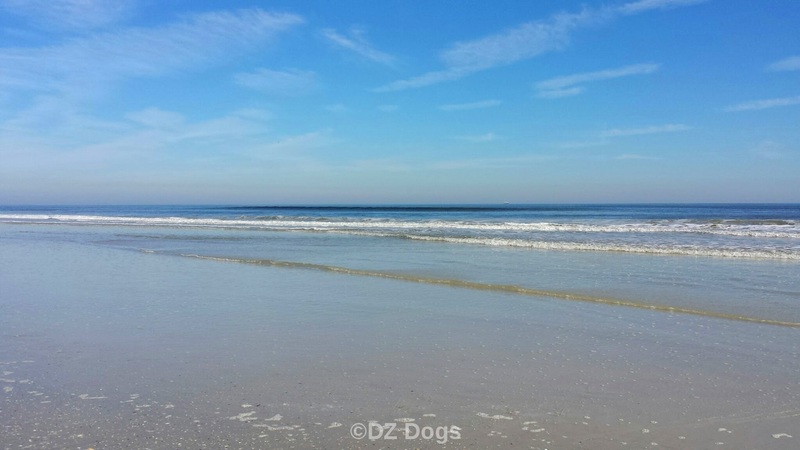 Jenna began her blog CorgiPants with her dearly beloved Sully who sadly is no longer with us. Turns out though that he is a lot like Ziva! 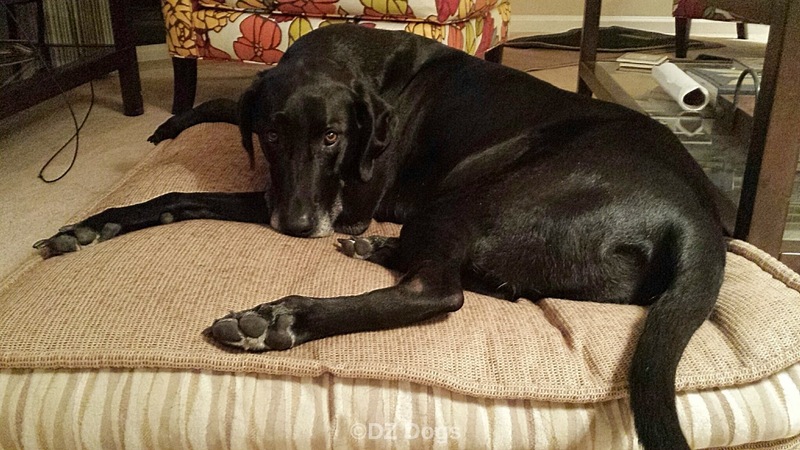 He was adopted out of a rescue and had some fear reactive issues with other dogs thanks to his background. 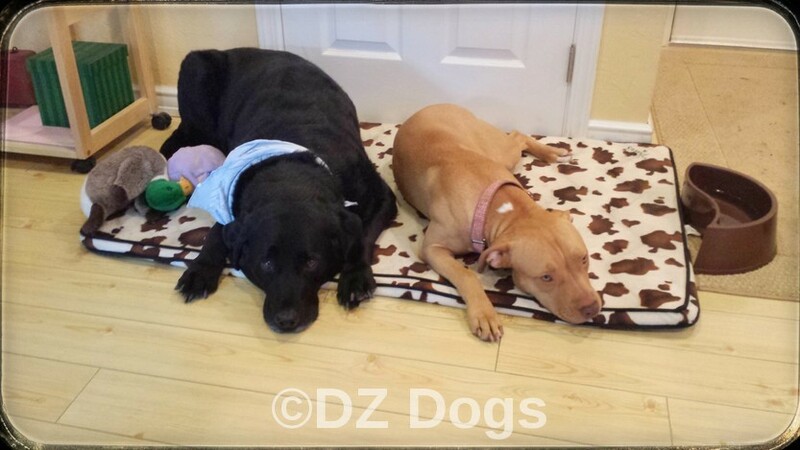 Thanks to her hard work, counter conditioning, and agility training she was able to build up his self confidence and she saw huge improvements in his behavior. Meet Dot! Dot is a beautiful Brittany who was adopted in January of 2013. Dot is an agility and obedience champ, who also does some scent work! Dot is also working as a Therapy Dog, in fact just a few weeks ago she visited some University students during finals week to help bring down student stress levels. I wish she visited my school during finals! What a wonderful way to encourage students! Next Meet Taco! 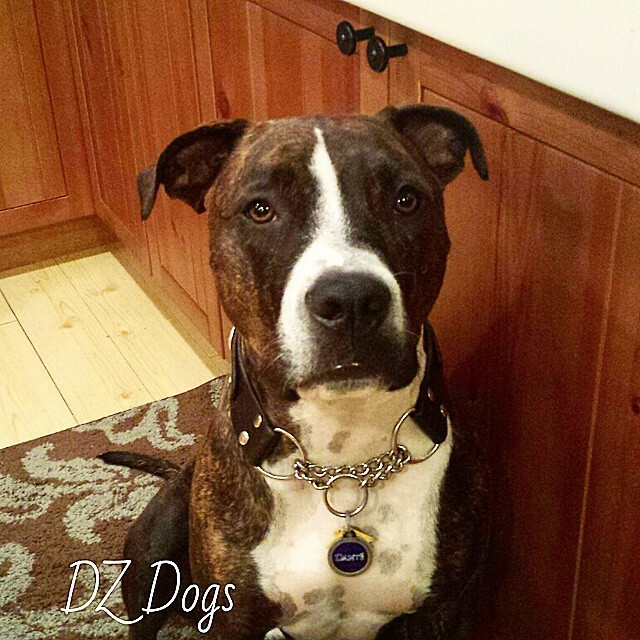 Taco is a beautiful lab pibble mix who back in November of 2013 passed his Canine Good Citizen Test! Way to go Taco! Jenna is a wonderfully dedicated mom, not only is Dot working but Taco is also learning some canine Rally, Agility, and scent work for fun. I don't know how she fits it all into her schedule but it sounds like a blast! 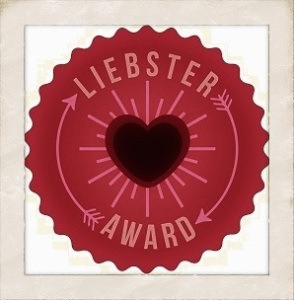 This is a wonderful and fun blog! 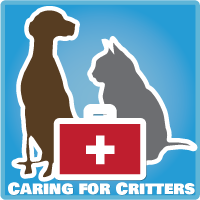 I love the enthusiasm and positive pet training involved in working with these dogs as well as the helpful health tips and treat reviews. And Jenna herself is an inspiration with all the sports she involves her dogs in and the volunteer hours she puts in with different groups, she seems to have a big heart for helping people and sharing the love of her dogs. I'm looking forward to following the stories and adventures of Taco & Dot! The hubby and I returned last week from a wonderful Florida vacation to visit my brother and sister in law who are expecting little Christmas twins (nope sorry, not puppies)!! Florida was a breath of fresh air compared to all the wet, gloomy nastiness that the Willamette Valley in Oregon has to offer this time of year. Sunny and 65! We were in HEAVEN walking around in t-shirts and flip flops while all the native Floridians around us froze. We visited the beach every day that we were in town, played some board games marathon style (we love games! ), made lots of homemade frozen dinners for after the twins are born, drank coffee, had wonderful wine, visited to the fullest extent, and walked and played with our niece Reya! 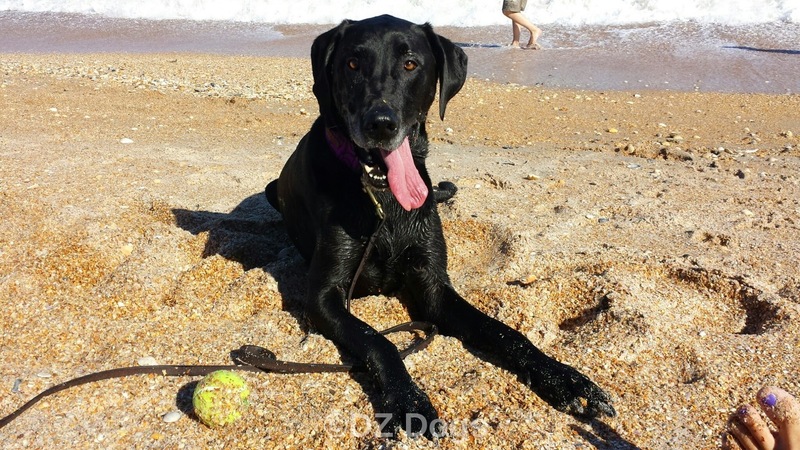 Reya is a Dane/Lab mix who is about 7 years old... She's such a sweetheart, we did lots of walking and playing with the tennis ball and of course we took her to the beach too! Personally I love the beach...On the Oregon coast you're lucky if you can find a sand dollar, and no way will you find whole shells - the ocean is too rough and rocky, everything is smashed to bits before it comes ashore. 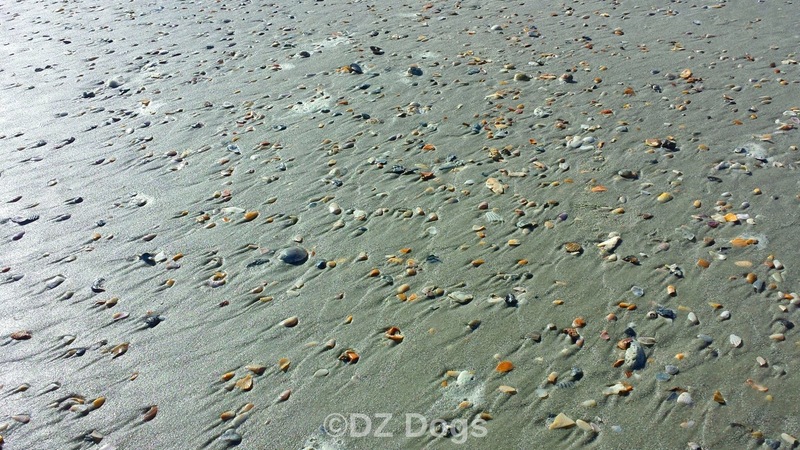 But in Florida everywhere I looked I saw shells! Most of the time on the beach I was looking down, I had to remember to look up! I had a great time collecting them, i'm making Christmas gifts for people using the shells as well as some jewelry for myself. We also visited a beach where it has been rumored that you can find sharks teeth. *And people wonder why I don't want to get in the water! Guess what?! I found two!! The hubby keeps threatening to move us to Florida, and this trip definitely made me think how nice it would be - at least in the winter. Maybe we can do our winters in FL and summers in Oregon. I love the FL wildlife but i'm not a fan of the giant bugs, spiders, stingrays, sharks, and loads of people. My handsome hubby enjoying the water. 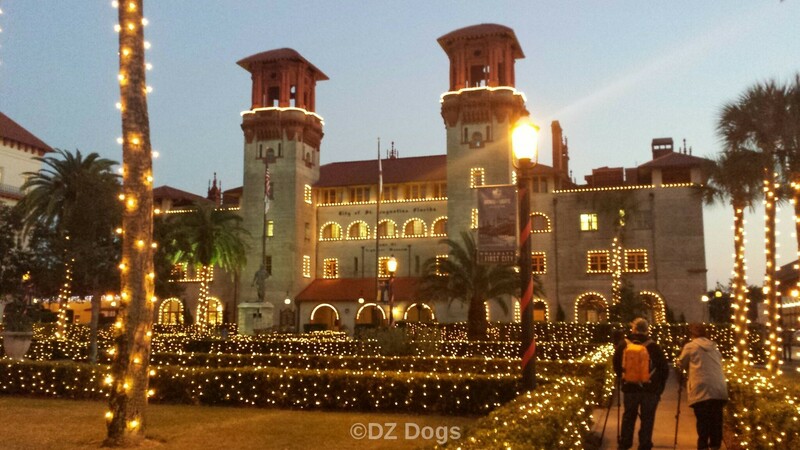 While we were in Florida we visited St. Augustine - a wonderful little historic city, and it was all decorated for Christmas. 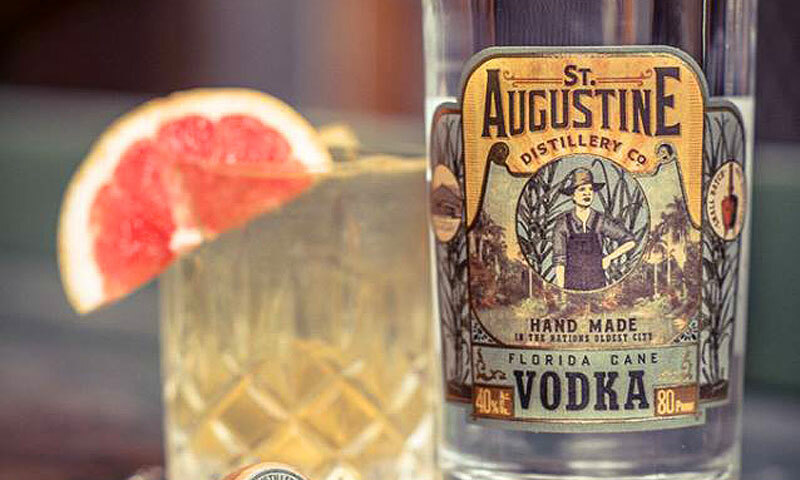 St. Augustine is the oldest continuously occupied city in the United States. It was founded in 1565 by Spanish admiral Pedro Menendez de Aviles who also became Florida's first governor and it served as the capital of Spanish Florida for over 200 years. 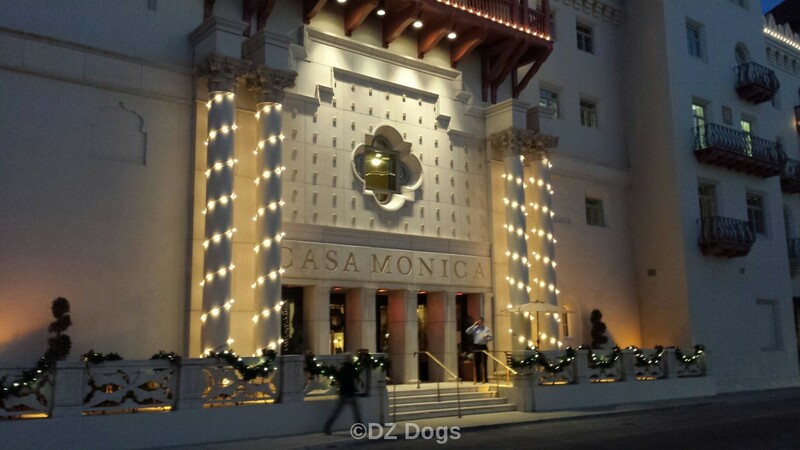 It's a beautiful city and a lot of fun to walk around in. Their are many different restaurants of various food cuisines, bars on every corner, and smaller food places like smoothie bars, and a whole store of flavored popcorn! On the edge of town is a winery, and a distillery that of course we had to visit! 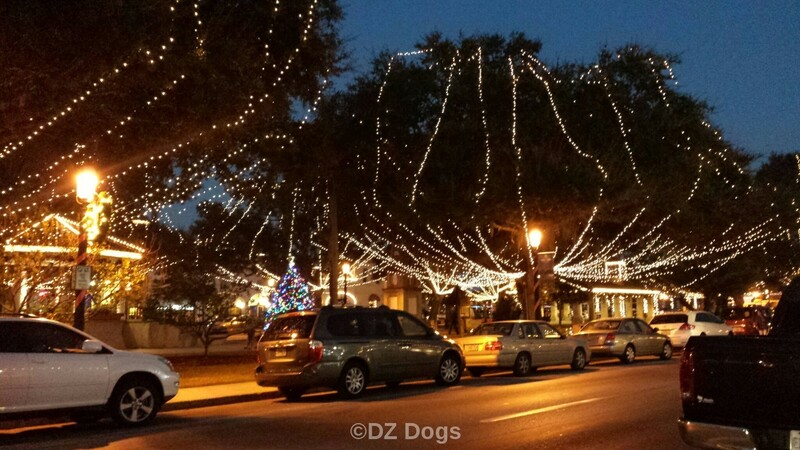 Since we had time to kill while his brother was at work, the hubby and I wandered our way around the many different shops and looked at the pretty lights as the sun began to set. 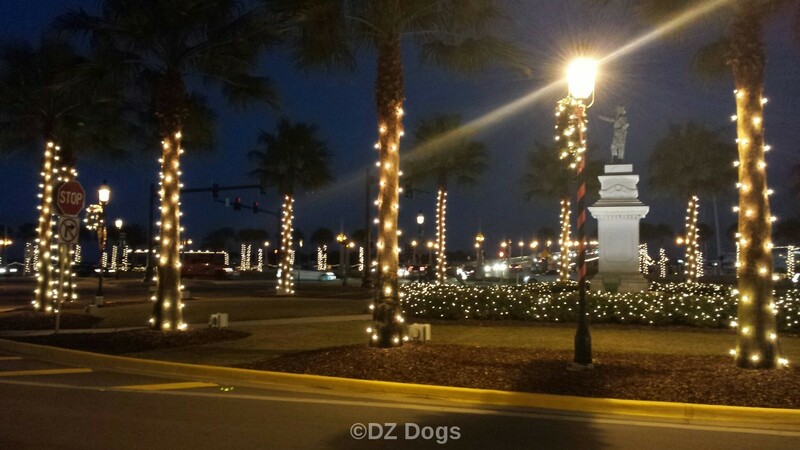 It was a bit strange to be seeing palm trees decorated for Christmas, but it was beautiful! Now you may ask...did we bring Dante & Ziva? Well no.. They got to stay home with my mom (their grandma) who was nice enough to house/baby sit both dogs, our two cats, and one Betta fish named Blue. We definitely missed them but i'm not convinced they missed us! My mom is a runner, she just loves it so she took the dogs out for a run in the mornings and every evening. They weren't a fan of 5:30 am wake up times, my prissy pups like to sleep in. But boy were they spoiled! And my poor mom, discovered the joys of having a puppy when Ziva decided to eat two of my towels, a dish rag, washcloth, and leash clip while we were away. Hence back to the crate training, and me now hunting for good puppy puzzles. It was awesome having Reya to snuggle up to when we were missing our kiddos. Look at that sweet nose... she's going to make a wonderful big sister to the twins!! We love our family! Thanks for the wonderful trip guys!! While we were in Florida we got to visit this lovely lady and two of her gorgeous dogs. Can you guess who this might be? 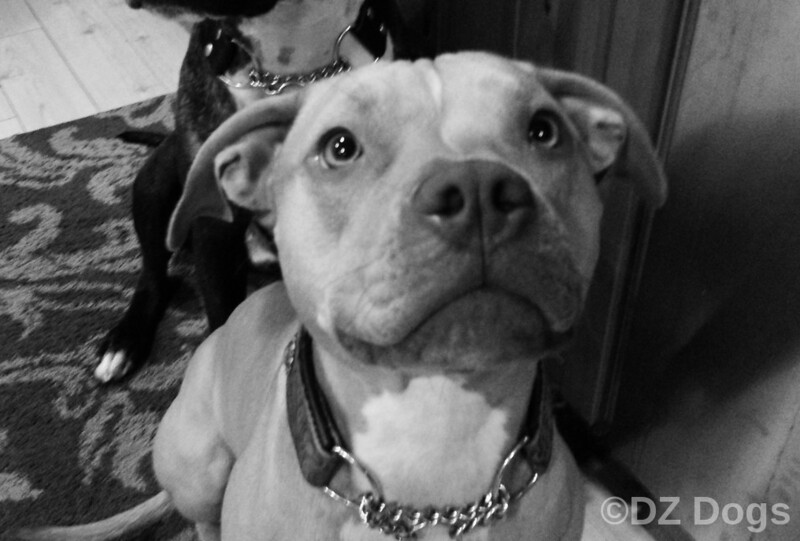 All the Reasons Pit Bulls are bad dogs. Thank you Dr. Laura for opening my mind. Pit Bulls are terrible creatures, they are unfriendly, scary to look at, no one likes them, and they are a waste of valuable space. The whole couch in fact, and if that isn't enough..your lap too! They eat a ton of food. Food that could be going to other dogs as Dr. Laura pointed out when she visited a local shelter, "all this money donated is going to feed pit bulls, so I don't feel like giving money." He's drooling, see his shiny lip? What a scammer. Think of all the starving dogs in the world, pit bulls don't need to be fed they just beg for food because they are selfish. Really they can survive on air and light alone. 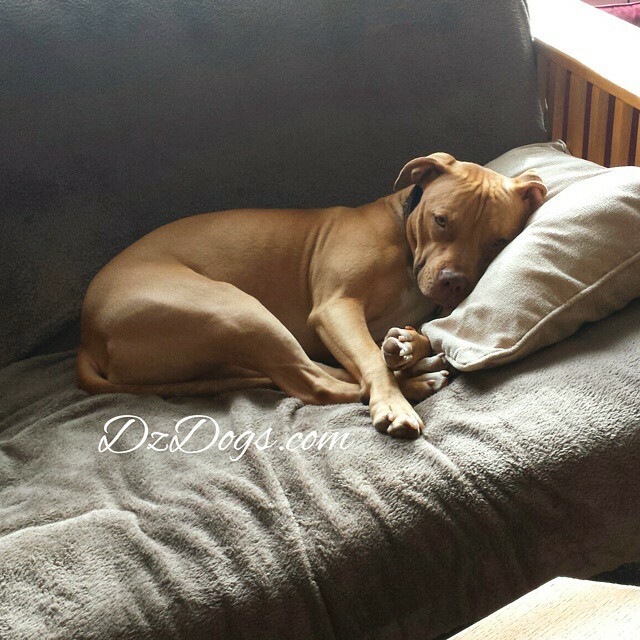 Pit bulls are scary - people cross the street when they see you coming. Go adopt a cute dog. 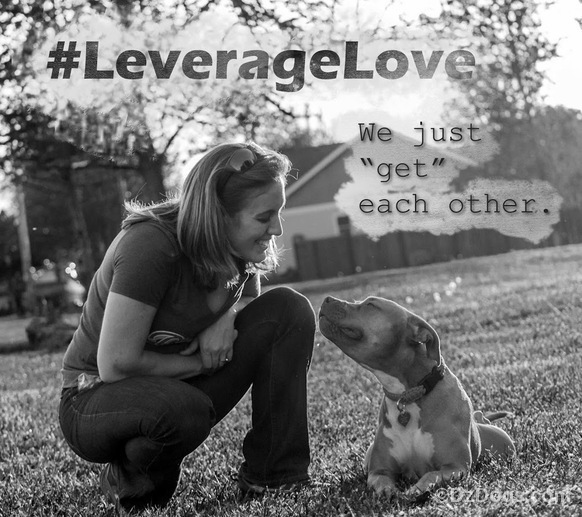 Or as Dr. Laura stated, "don't walk around with a pit bull, no one will talk to you." My what big teeth you have! - "The better to eat you with my dear!" 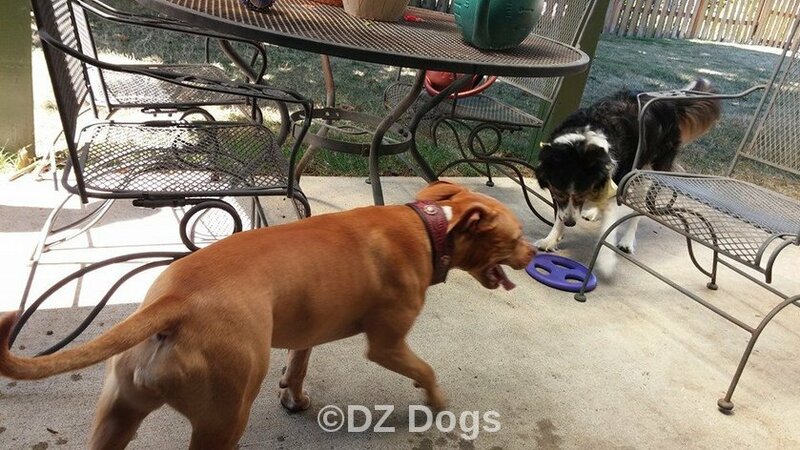 A comment I will never forget from a stranger, "If you put two pit bulls together they'll fight. They can't be trusted." No dogs were harmed in the taking of these pictures. They really do play this way! And we supervise to keep it controlled. 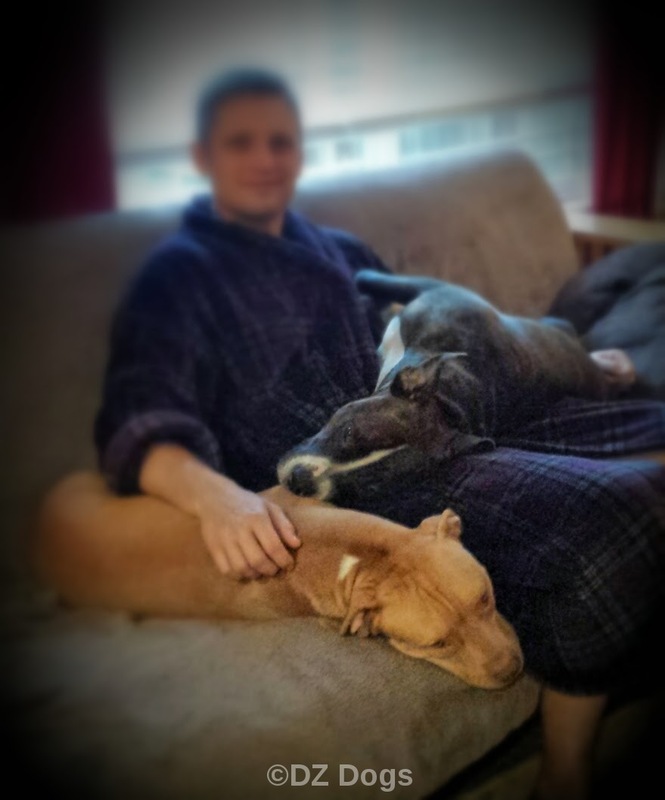 "Pit Bulls are overly aggressive, they were bred that way and are different from other dogs." Yup, aggressive. She hates other dogs, can you tell? "Pit bulls are natural killers, they can't help it that's just how they are. All Pit Bulls are dangerous." Ziva's soon to be snack. Keep that dog away from that child! Careful kid! She might take off your whole hand! As I hope you can see. Pit Bulls are terrible creatures. They are stubborn, love the mud and yet are prissy about the rain, they are bed hogs, couch hogs, fighters, terrible around other dogs, bad with small animals, will kill children, and will definitely turn on you in an instant. And yet, I couldn't imagine my life without them. The hubby and I often joke that Dante is a wise old man reincarnated as a young vibrant dog, when he looks into your eyes he sees your soul. He is loving, holds no ill will towards man or beast, and just wants to play and be loved. Ziva is our princess, she is a bit less confident than Dante but she is growing in personality and character every day. Dante for all his energy is a better snuggler, he's either "ON" or "OFF". 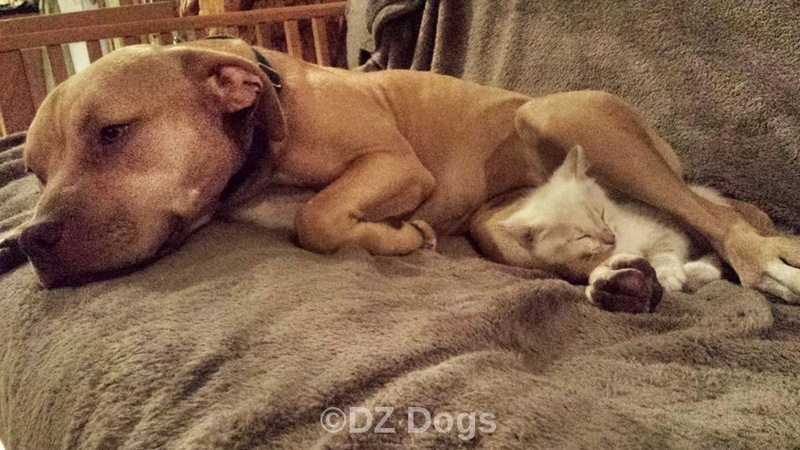 Ziva loves hugs, she enjoys giving high fives, and sitting in your lap on the couch but she gets too hot for full on body snuggles so she prefers to sleep at your feet. We work hard with our dogs, YES pit bull terrier have "terrier" in them - this mean they have a natural prey drive for small animals. Terrier breeds were bred for hunting, that is just the way it goes. This doesn't mean that they are incapable of learning however. 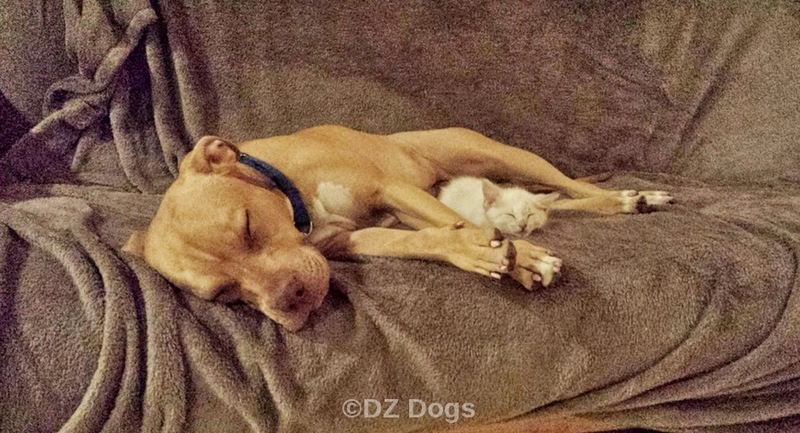 As you can see, Ziva adopted a foster kitten we had over the summer. Foster Kitty Story HERE And both dogs live indoors with our two cats, they are often left unsupervised for hours at a time and have never attempted to harm the cats. The cats on the other hand have swatted and made sure the dogs know their place in the home. The cats rule over all of course. Our dogs have never bitten anyone, and would never bite us. This doesn't mean they are incapable of biting - all dogs are capable of biting but no dog will bite without provocation. 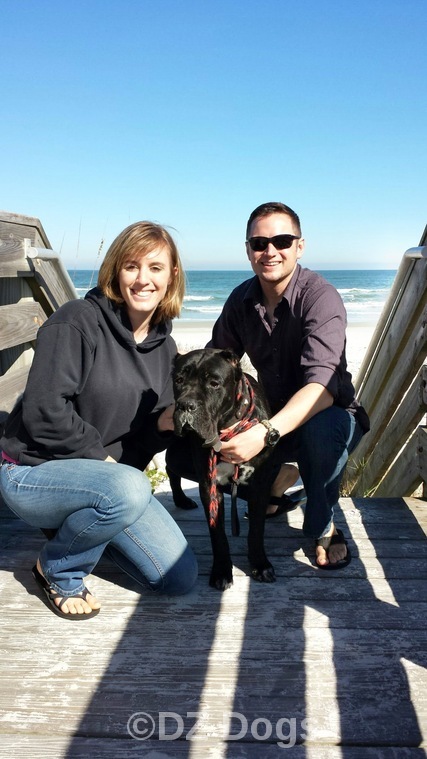 It is thanks to people like Dr. Laura that breed stigmas and stereotypes exist, it is the same thing as racism and why breed specific legislation (BSL) is still in place around the country. 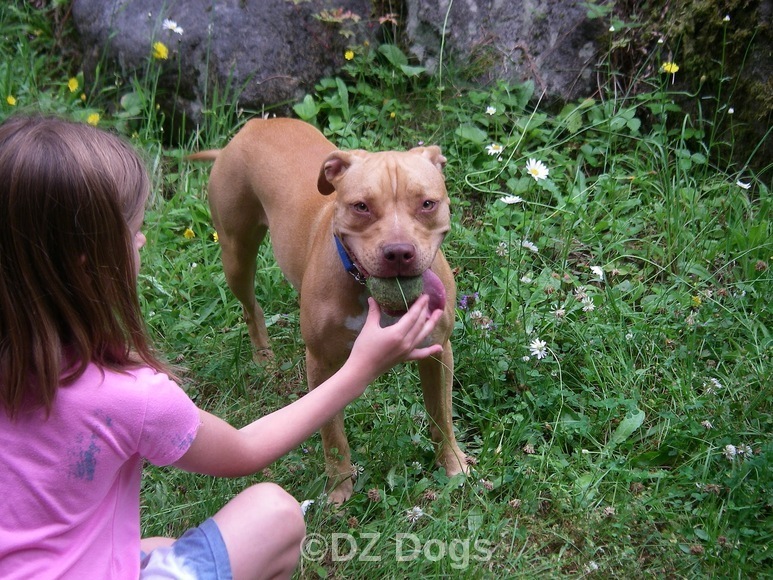 What is BSL? "If you're out with a Rottweiler, nobody will talk to you. Take a cute pet for a walk." Dr. Laura also visited a shelter and there were about 95% Pit Bulls type dogs and Pit mixes. On a good note, thanks to her nasty remarks outrage was sparked in the animal community. Many are calling for her removal from the air and thanks to mounting pressure some sponsors are dropping her show. "I know this is gonna get somebody angry but I think they should all be put down. First of all, they were taking up space and nobody was going to adopt them. That's why they were all there; people were getting rid of them." "Don't walk around with a pit bull. Nobody will talk to you." Please do not visit her website - we don't want her to have any traffic. This video was recorded and posted to youtube.com via a listener. Dr. Laura is just another example of a blabbering idiot, who rather than being educated chose to spew untruths. She could have done a lot of good by supporting local shelters, donating money to help dogs/cats in need, and being the animal lover she otherwise claims to be. She could have chosen to address why their are soo many dog in the shelters: animal over breeding, backyard breeders, animal hoarders, puppy mills, and irresponsible owners who should never had gotten a dog in the first place. She could have addressed that "Pit Bull's" do not exist. It is just a broad term for a body type, she could have addressed many things but she chose to be ignorant, uneducated, mean, and hateful instead. Please show your support and love of ALL DOGS through social media, she has a Facebook page and twitter handle. Her twitter handle is @drlauraprogram many people are using the hashtag #whydoyouwantmedead and posting pictures of their beloved pets. 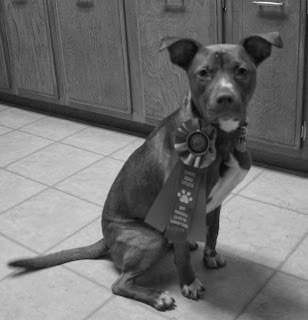 And Please, please educate yourself and those around you about the truth about Pit Bulls. More truth about Pit Bulls Please visit these wonderful pages for an inside look at the breed. 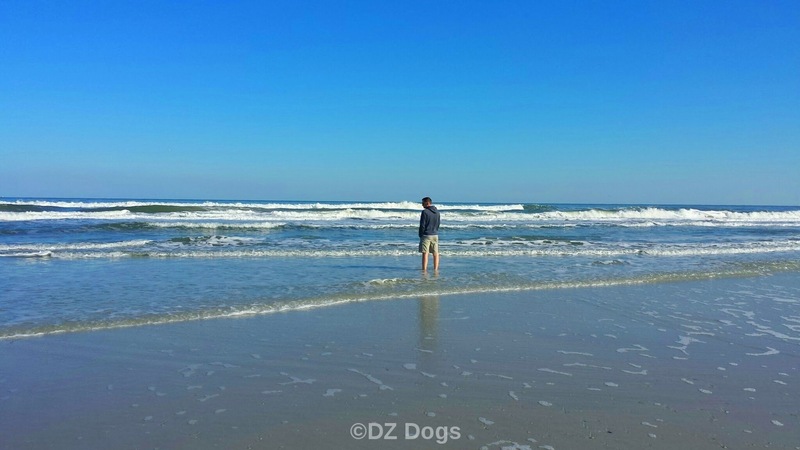 Living in Oregon we get very jealous of our blogger friends who live in the sunny states of California and Florida. While they are basking in weather that is sunny and 65, we are being drowned out by loads and loads of giant rain drops that soak you clear through if you so dare to step foot off the front porch. We do have fun though in the rain; Oregonians are Crazy - HERE. One thing to know though..we live in the Willamette Valley portion of Oregon which is particularly wet in the winter. If you live in Eastern, or Southern Oregon you get less rain and more sunny days. The hubby has been threatening to move us to the Rogue area (Southern Oregon) in the future for this reason. Well thanks to this lovely weather, the dogs don't want to go outside...we practically have to drag them. Just the other day the hubby was standing in the rain, calling them into the yard to "go potty", and they just looked at him like he was crazy, and refused to leave the front porch! 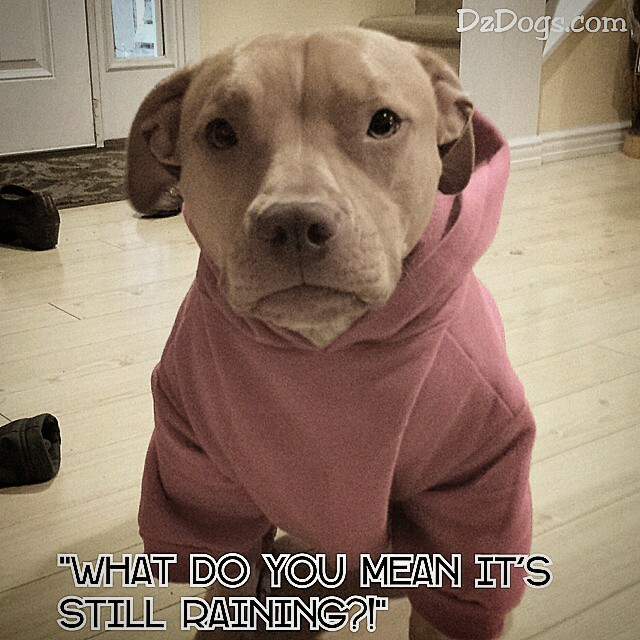 My poor wet hubby ended up returning to the house, bundling the dogs up in their coats, and then scooting them off the porch just to get them to go potty before bedtime! Haha! Also brought by the rain...my Piranha Puppy Princess of Destruction! We thought that we had busted her destructive chewing when we did the Crate Training - that link HERE if you need help, we got her successfully trained and the chewing stopped so we quit locking the dogs in their crates. Our ultimate goal is to have them loose in the house while we are gone - Dante has already proven himself trustworthy but Ziva had to earn it too. Well...bad weather leads to dogs not wanting to go outside..which leads to not getting as much exercise, which leads to puppy brains getting bored...and the resurfacing of the Piranha Princes! At least she hasn't been as naughty as Cairo over at Walks With Rama! So now we're back to Crate Training...unfortunately this means Dante too...we can't leave him out and Ziva in or else it causes her to be anxious, it can also cause jealous in some dogs. She once again must learn to stop chewing, our goals are a little different this time. We want to re-establish the crate as a place of calm and sleep, and re-establish appropriate chew things. So now i'm looking for good puppy puzzles to keep her occupied! So I went shopping and this is what I came back with. 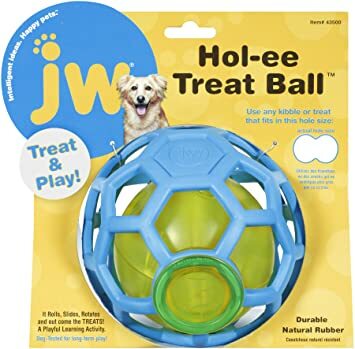 Made of non-toxic natural rubber this toy is designed to be rolled around, as it rolls treats are dispensed through a small hole. I was a little disappointed with it... 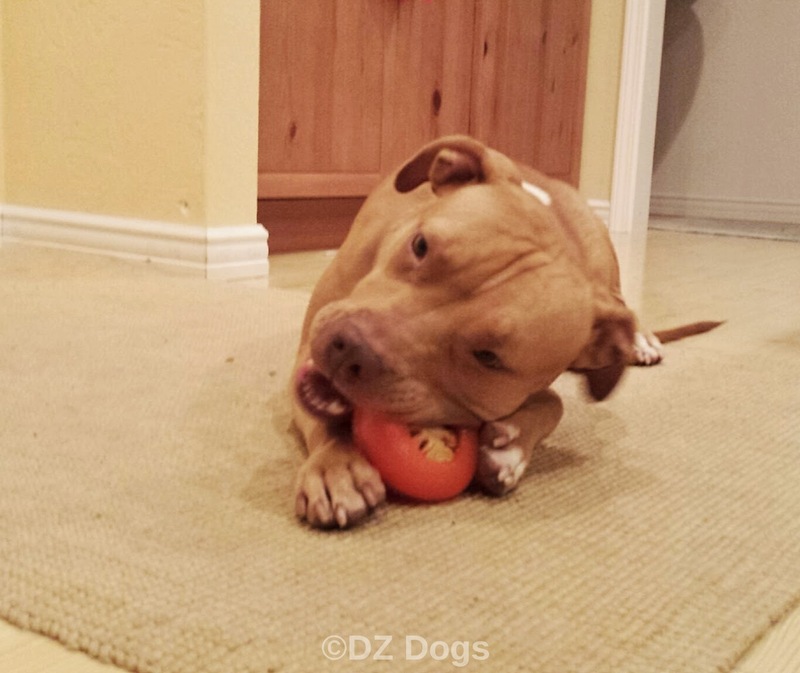 If you are going to feed you dog a meal and want to slow them down - then this is a great toy for you! But if you are looking for a puzzle it's too easy, and it gives the treats out too fast. They say hours of endless play but honestly if you kept it full of treats all the time you'd end up with a tubby pup! I ended up placing a piece of tape over part of the opening to slow Dante and Ziva down and I filled it with their kibbles. After they played with it for about 30 min, I decided that I'm going to return it because on second look - it's going to be way to easy to just destroy. But it was fun while it lasted! They loved getting treats out of it. Please however be sure to supervise - if you have pups like mine this toy can be destroyed in an instant! 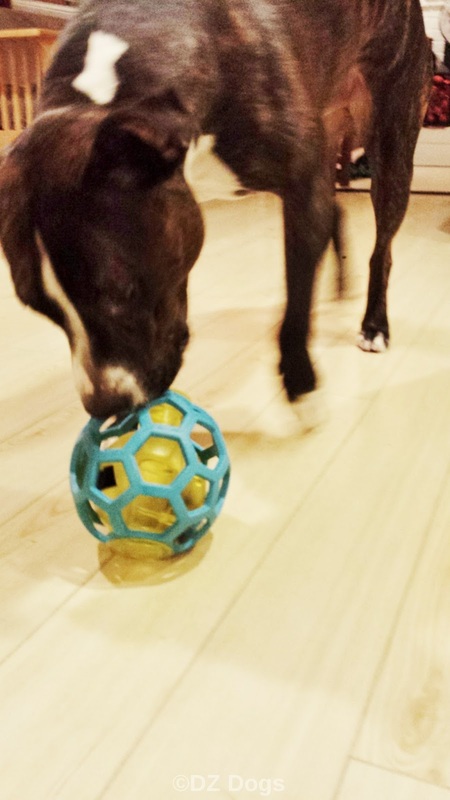 We give this toy 2 out of 4 paws approval! This toy I was a little more impressed with! 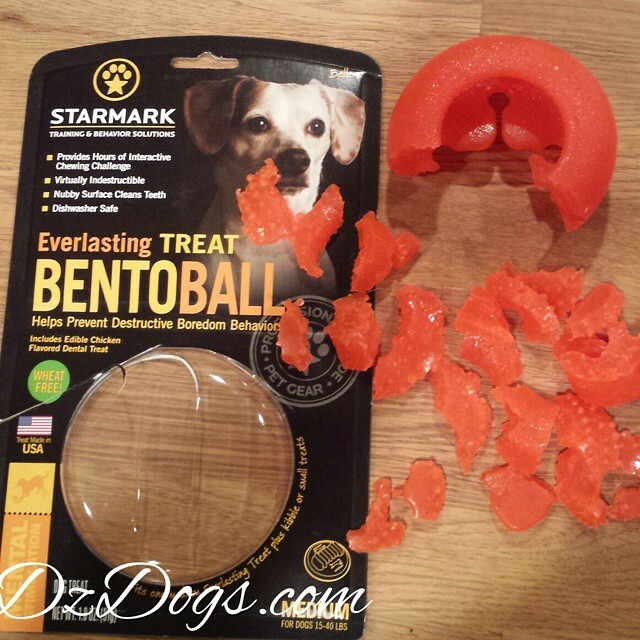 The treat was very hard and goes inside the BentoBall which is a odd shape so it rolls around while your dog is trying to chew it. Dante figured it out though and somehow managed to pop the treat out. I then put it back (no easy feat!) and he did it several more times in a row! He learned how and could duplicate it...little stinker. So I ended up giving it to Ziva once he had eaten one treat. This toy was much more fun, it was harder to get at the treat, and if I had watched her better I could have stopped her from completely destroying it. But unfortunately it was not made with bullies in mind. And now I'm back to the drawing board! I think for the future we'll stick to horns, hooves - filled with frozen peanut butter/goodies, and the very durable Kongs filled with frozen treats. As well as antlers, and other all natural chewies. I do want some puzzles though so I will continue my hunt! Do you have any favorite puzzles you think we might enjoy? We'd love to hear your suggestions!